Thanks to Brad Nelson, a Quality Manager in the Food Industry for sharing his experience on our blog. Recalls in the food industry can cause massive losses and even worse, cause harm if people, pets or livestock are directly affected before a food contamination issue is caught. In other industries lines can be shut down and safety can be an issue. As a distributor of engineering plastics we think there is often no better way to learn than by hearing the stories of those who are willing to share their experiences and what they learned so we truly appreciate Brad sharing his experience of engineered plastic solutions with us on our blog. Knowledge of materials is more than the question of how much, it’s a question of what is the right material for an application. ABOUT 5 Years ago, there were a series of events that transformed some of my thinking within the Food Manufacturing Industry. 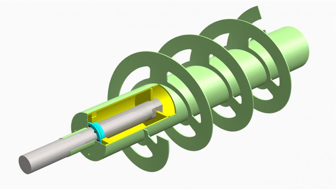 While working as a Quality Manager within the industry, we had come to find that we were having premature failures of some hanger bearings in a variety of screw-type augers. (See image) Unfortunately the mode of detection came from an employee who witnessed the plugging up of extruder die heads. These, of course, had been running for several days by that point, and we had no idea when the thermoplastic ‘bearings’ had begun to melt, extract themselves from their metal housings, and become a potential food safety issue. After a long and arduous investigation, there were several hundred thousand pounds of product that were on hold and subsequently destroyed. As one would expect, senior management was extremely concerned about repeat issues. Through several rounds of research, we determined that the primary failure mode was a maintenance practice issue, in that they were misaligning the screws creating a slight wobble that would wear the bearing faster than normal and then begin a spin that then would heat and melt the thermoplastic. Round one of preventative action: let’s change our maintenance practices. Worked great! For a time… then we came to discovery number 2. Again, we found ourselves in a similar predicament of product destruction and direct emails from executives to “figure this out”. Not that that helped, but it certainly adds to the stress. We approached our supplier of the hanger bearings about different materials to use – we discovered that they were experimenting with various metal impregnations at different levels. We were very willing to be the guinea pig at that point, and gave them the green light to manufacture various levels of impregnated material into the resin. I was a skeptic, and a fairly harsh one at that. I made the team run through a Probability of Detection trial on various detection devices (Metal Detectors & X-ray) to see what size, shape, and mass we could detect at 100%. We then compared this data to our MTBF (Mean Time Between Failures) data on the bearings. We managed to find a happy medium of detectability and of life-length. The rest of the story you ask? Well, we found that fixing the screw alignment was only part of the failure mode for the assemblies, and found other mechanical changes necessary when it came to the longevity of the plastic components. But, before we knew it, we discovered something else. This time, it proved to be our metal detector on the end of the processing line. A couple of shifts had gone by with Maintenance trying to ‘fix’ the problem of the continued rejections. The report had surfaced in our daily production meeting. I questioned it several times; only to receive the response back that “we didn’t find anything”. I decided to go look for myself, and sure enough, I took some of the rejected material (> 200 lbs. worth) over to our off-line sensitized metal detector. Shazam, I found this blueish powder in the reject bucket after just a few scoops. Guess where that came from? You guessed it, the hanger bearing assemblies further upstream. Lessons learned: ‘detectable’ thermoplastics work, and they work great! Design and Food Safety Planning are the keys to success. Advising and training your plant floor on what to look for in failure modes is critical. For the few pennies / dollars more per unit you pay upfront, you avoid many a headache in the future! We hope to bring more stories like this in the future. As more engineering plastics like the detectable materials Brad talked about are developed we need to understand how these can really work as part of the whole. How are engineering plastics affected by the materials around them, how can quality and maintenance teams quickly find potential part failures, and how these amazing materials can bring safer more reliable conditions. Keep up with us here on our blog and check out our online catalog at onlineplastics.com. On this site you can easily find items like Ultra Detectable materials, the latest in FDA compliant engineered plastics solutions for the food processing industry as well as many other well known plastics plus articles on industries and more. This entry was posted in Engineering Plastics, Food Processing and tagged Engineered Plastic Soltuions, engineering plastics, FDA compliant plastics, plastics for food processing, thyssenkrupp Engineered Plastics on February 7, 2017 by ainadmin. ability to create a quieter work environment. 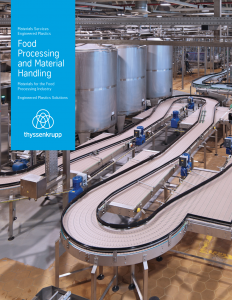 With 2014 looking to be a great year for Food Processing equipment sales I wanted to share what we most find in food processing applications and why. UHMW continues to lead the way (by pounds sold in the United States) in the transformation from metal to plastic parts. For more information on materials sold in the U.S. see this article by the American Chemical Council. Compared to steel UHMW is just 1/7th the weight. In addition UHMW is corrosion resistant. UHMW is a great option for room temperature applications like guides, paddles, and cutting surfaces. Recent advances include the introduction of metal detectable versions that can be recognized by your detection systems in line. For bearing and wear applications, Nylon materials have been the workhorse for over 30 years. Like UHMW, Nylon is also light weight, and provides lubrication – free operation making it a great material for producing bearings or bushings. Gears and sprockets made of Nylon have been popular because they can reduce noise in work areas. They can also improve the efficiency of production lines conveying food and liquids in your plants by lasting longer than metals, which reduces downtime, and by allowing lines to run faster. For many components, Acetal is the best choice for metal replacement, and we find its popularity is growing quickly in the food processing industry. Acetal (Delrin Homopolymer or CoPolymer brands like Acetron GP and Celcon) are very easy to machine, and their very low moisture absorption rates make them a good choice for the often wet environment of food processing. Acetals are harder than Nylons and maintain dimensional stability where Nylons tend to be more flexible. In many applications Acetals can handle continuous use temperatures up to 210° F and they are typically compatible with most cleaning solutions, a huge plus in the food processing industry. A popular speciality material is Quadrant Engineering Plastics Ertalyte material. Ertalyte has unique properties that allow it to wear like Acetal in wet environments and like Nylon in dry or unlubricated environments. I like to think of it as giving you the best of both worlds! Ertalyte also is highly resistant to stains generated by things like tomato based sauces and green vegetables. Ertalyte also has high dimensional stability that meets the demands of the highly precise machining tolerances required in filling pistons and fluid manifolds. In looking to the future of food processing the demands are heavy. Companies are working hard to keep consumer prices in line while still making a profit. 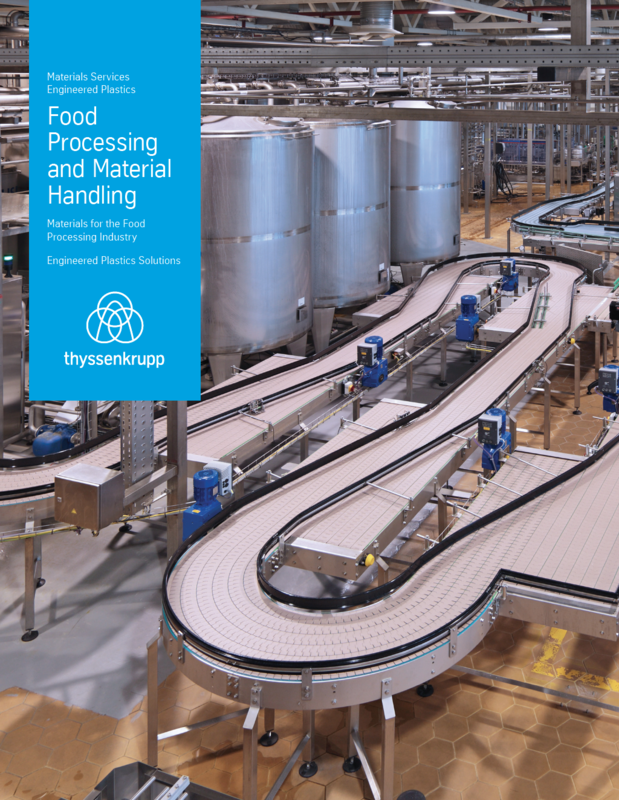 Food processing companies are achieving these goals by improving efficiency and creating better work environments. Plastics are an increasingly big part of the solution because their use in parts can improve line speeds, decrease maintenance downtime, and even make for a quieter work environment. As I look at the Engineering Plastics and High Performance Materials we have here at AIN Plastics I’m pleased to see how they are being used to improve the food processing industry and I’m excited to see the new applications our customers are working on as well as the new materials our suppliers are always working on. If you have an application you’ve been scratching your head over, give us a call. We know there are lots of options and we can help you take some of the guess work out of finding out if Engineering Plastics are right for your application. This entry was posted in Engineering Plastics, Food Processing, High Performance Plastics, Machining, Plastics and tagged Acetal, AIN Plastics, engineering plastics, ERTALYTE, Food Processing Materials, nylon, Quadrant Distributor, Quadrant Engineering Plastics, ThyssenKrupp Materials NA, UHMW on January 30, 2014 by ainadmin.